After the first house fell through – we got back home from Florida and tried to re-group. We were still looking but we took a weekend off. Afterwards it felt like we were more determined than ever to find our next place. We went to more open houses and set up more appointments. We started looking at houses that were in a slightly higher price range than the Turk Hill house. We realized that the market right now is very hot, so if you find something you like you have to jump on it. Some houses would go on the market – we would wait until Sunday’s open house to see it – just to find out it was already gone. We requested to see this one house. It was built by a local builder named O’Brien. 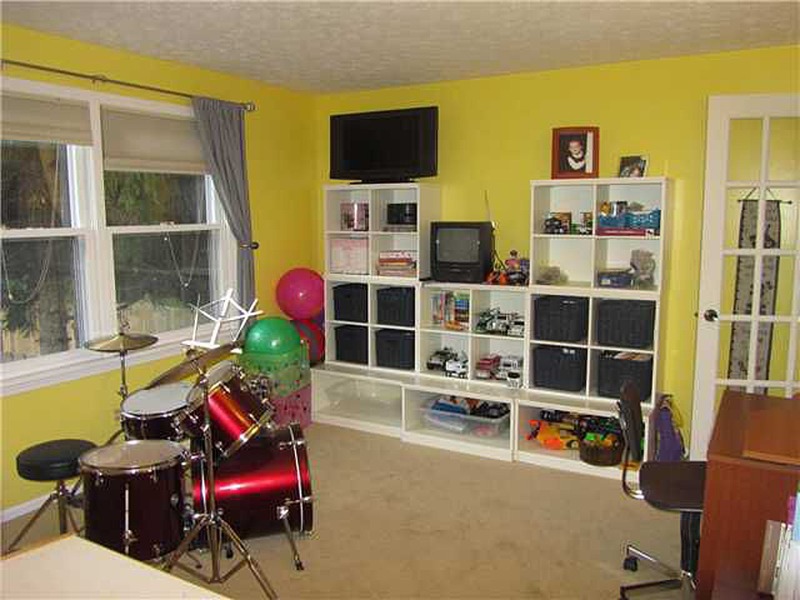 This house in particular had some upgrades done that made the layout really appealing. 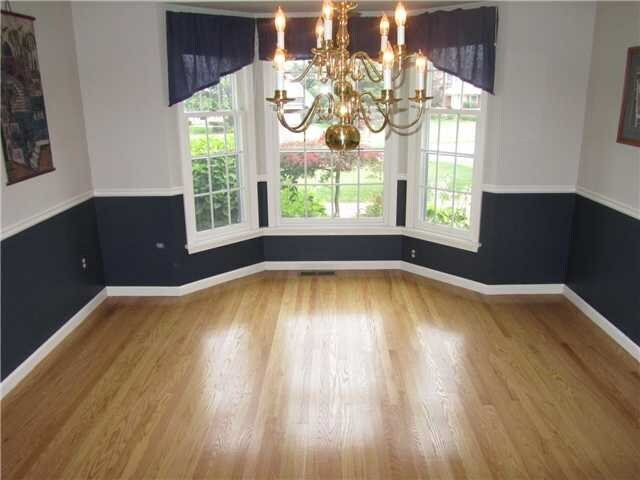 The thing about O’Brien homes is that he insisted on putting hardwood floors throughout. 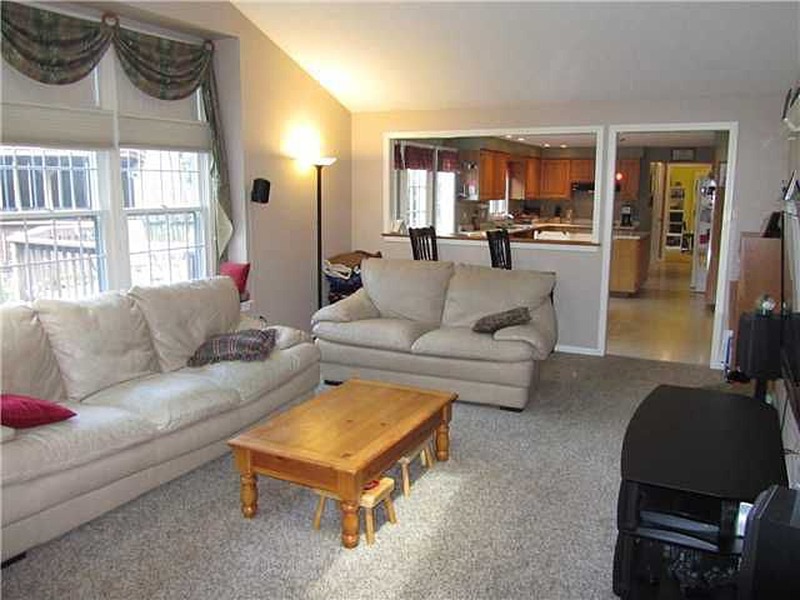 So even if there is carpet down – there are hardwood floors underneath. The house we walked through was really on the top end of our budget and it didn’t end up being for us. The driveway was much steeper than it appeared to be in the photos and the backyard also was unexpectedly steep, tiered up into three levels. But the house itself was appealing. At this point we had a pretty specific area we knew we were interested in living in. We looked at one that I really wanted to love – since it was literally 10 houses down from where my best friend just bought her house. But that just wasn’t the right fit for us. There was another one that my husband, Mark found – but I wasn’t really excited about it – the layout or the price, however the neighborhood was really cute. Then two different O’Brien homes came up in our search. Slightly different locations – one for sale by owner – one listed with an agent. 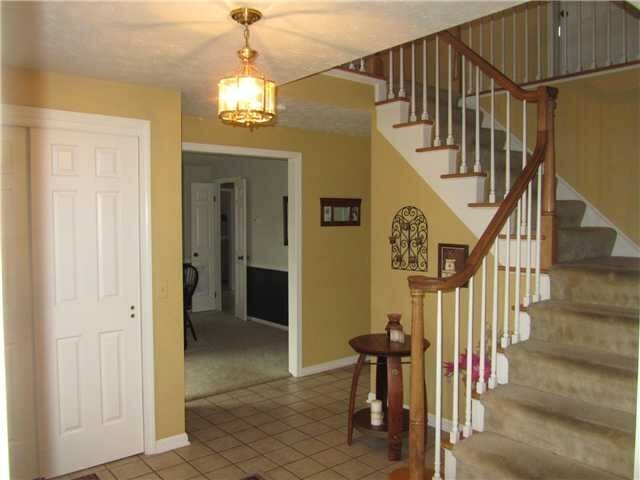 The inside of each house had identical layouts, except the one listed by owner was a higher price with more wallpaper. 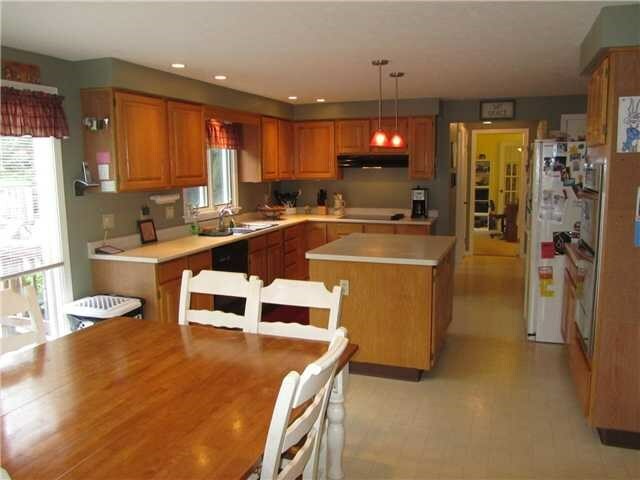 We requested a showing of the house that was listed through a realty company. This one was closer to our ideal location – plus it was still relatively close to my good friend. We went to see the house after work one day – the commute for me being about the same, but cutting my husband’s commute at least in half. A good start. The neighborhood had a nice feel to it – kids playing outside, people grilling and going for walks. 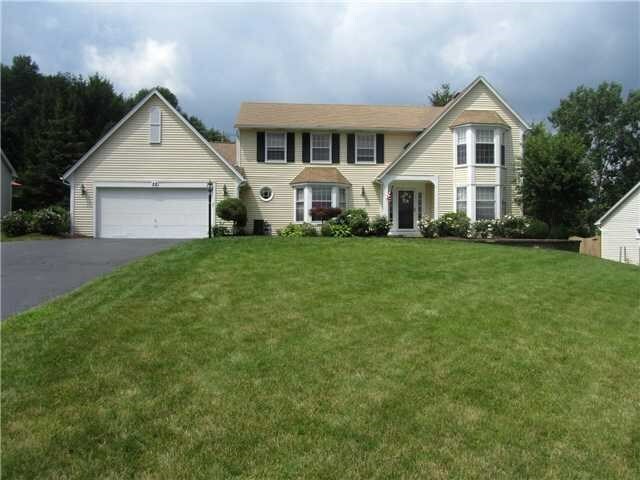 This house is more the typical house for our area – a 2 story colonial (unlike the last house). It has a nice feel to it. We really wanted a house to have an open feel – mostly between the kitchen and living space – this house has that. There is a formal large entryway with a living room off to the side with a bay window, the dining room off to the other side. 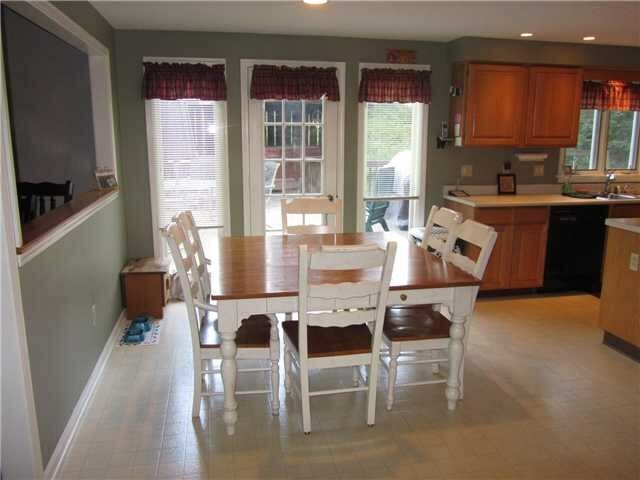 Next to that there is saloon style doors to the front of the house into the dining room. 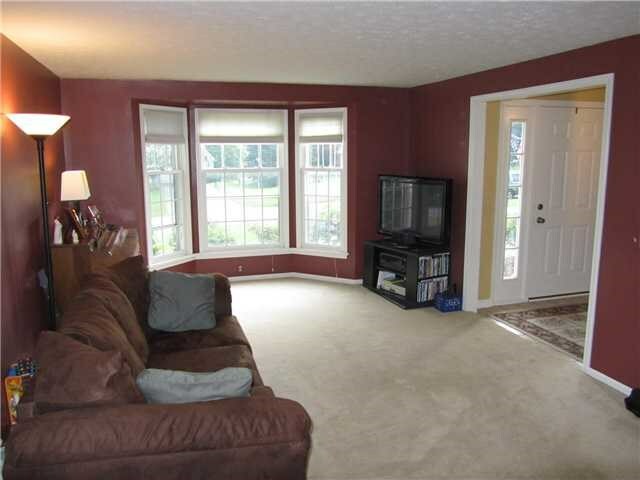 This is the only room in the house where they pulled the carpet to show that there are the hardwood floors underneath. 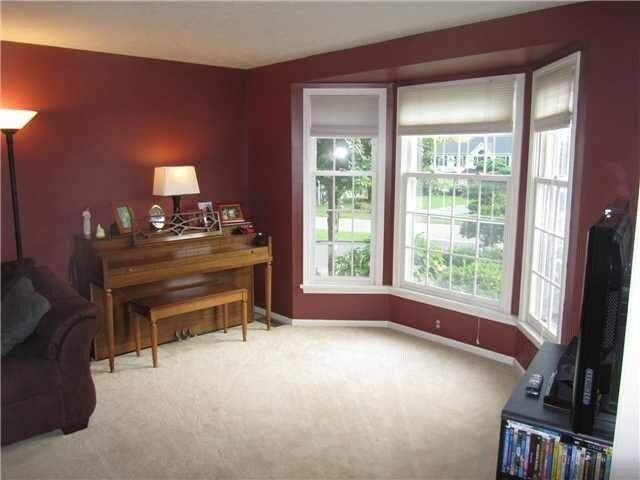 The formal living room is currently this maroon room with the carpet and bay window. 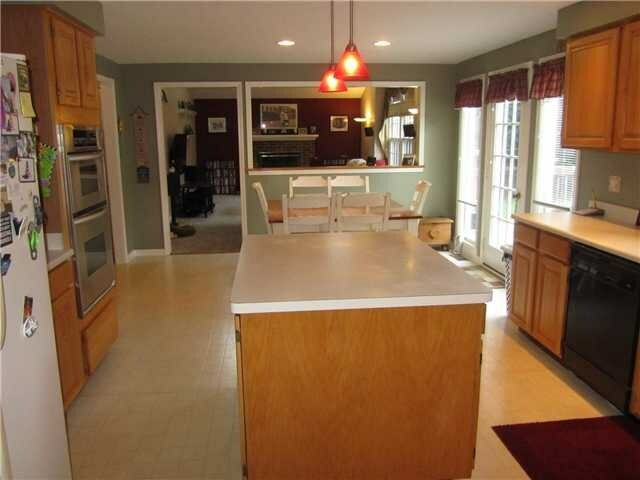 The kitchen is large, with an island. 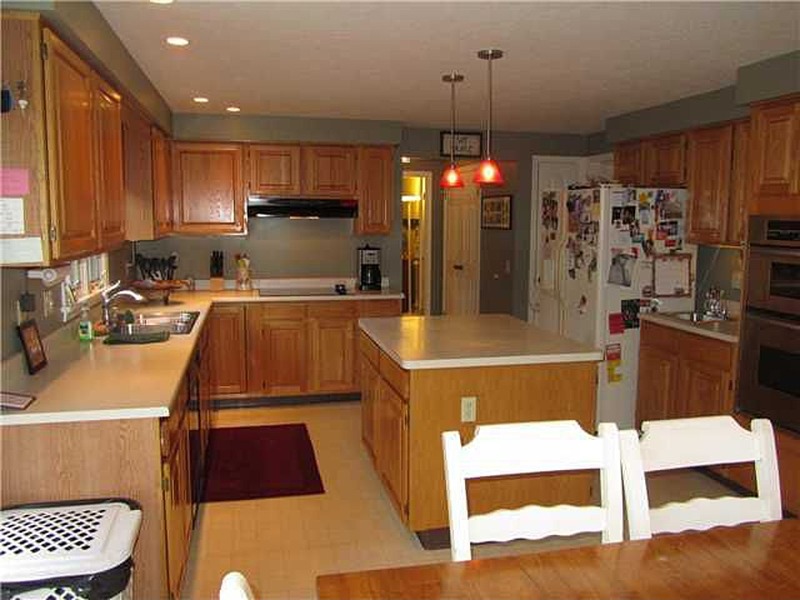 It hasn’t been updated since the house was built in 1988 – so it has the typical oak cabinets and plain laminate counters. It has enough room for a table and chairs. It has access to the back deck with two tall windows on either side of the door. 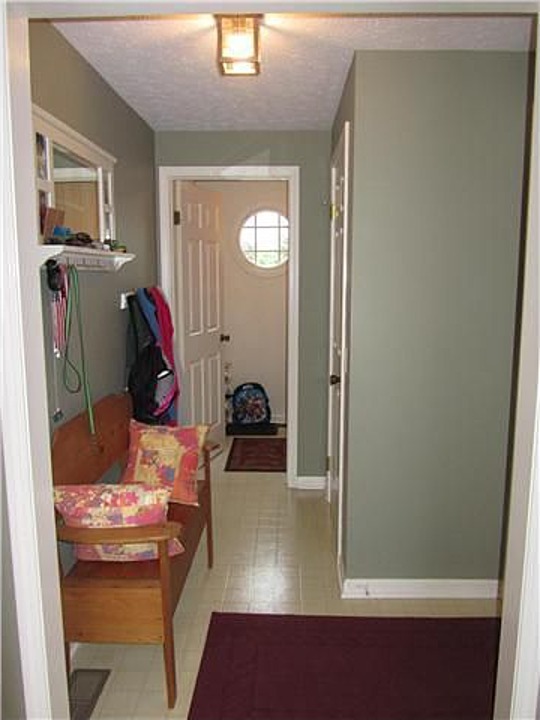 If you go towards the front of the house there is a small hallway that comes from the garage and it goes to the first floor laundry room at the front. The main living room is large – with a vaulted ceiling a fireplace and a large window that goes along most of the back wall. It has a cushion for a shallow seating area – or as I picture it – a nice place for a cat or 2 to nap. 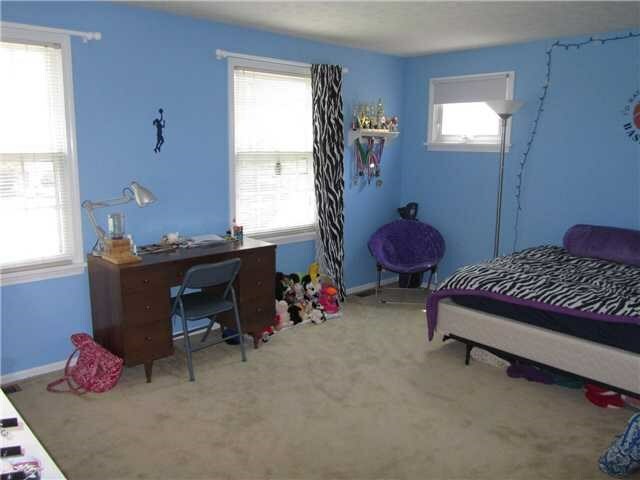 This room currently has carpet – but as mentioned before – there are hardwoods underneath. In the back corner of the house there is a bedroom/office. We would use it as an office – the doors currently have glass panes – but the room does feature a closet (hence the bedroom option). In between the kitchen and the office there is a small hallway with a pantry and half bathroom – same cupboards as the kitchen. There is a small mudroom from the garage into the kitchen – it also leads into the first floor laundry room with the circular window. Back upstairs the stairs have a 90 degree landing going upstairs. Where there are a total of 4 bedrooms and 2 full bathrooms. The master bedroom has it’s own bathroom and walk in closet. The thing I found the most strange here was the use of carpet – the carpet continued into part of the bathroom slightly. 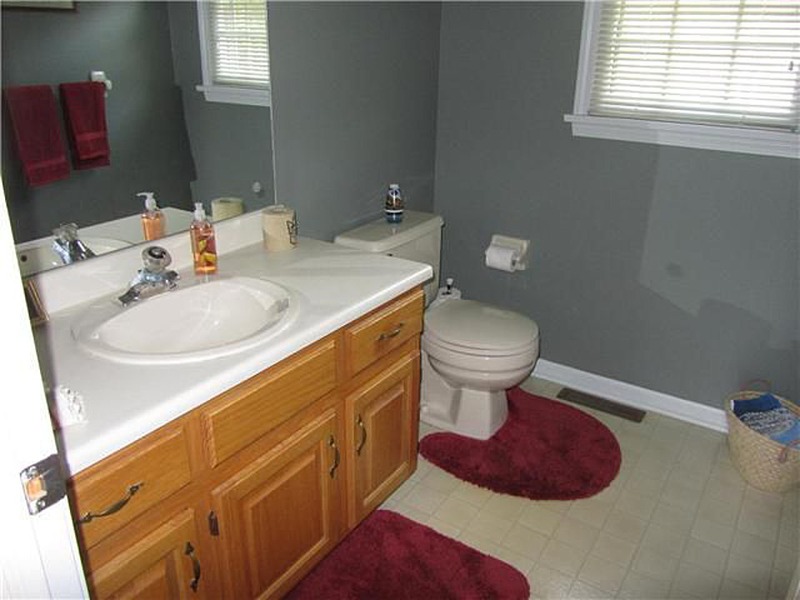 There are 2 sinks and they are separate than the toilet and tub/shower room – and that whole area is carpeted. The good news is there is hardwoods underneath – I just have to convince Mark that it will be better as hardwoods. 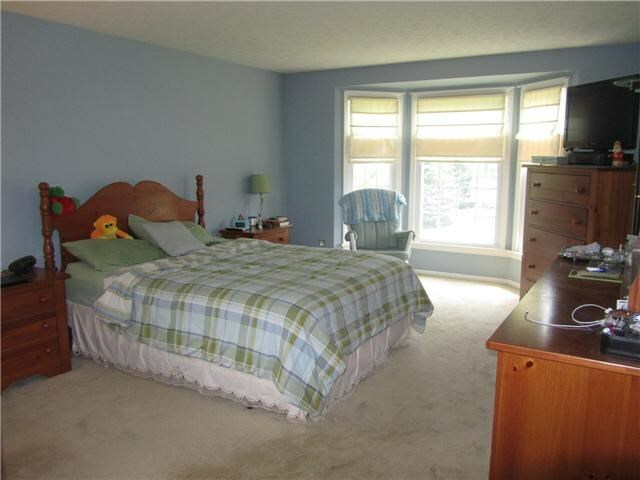 The bedroom also features the bay window – since it is directly above the living room that also has one. The 3 other rooms are all good sizes – the second bathroom also has 2 sinks in the first area and then the toilet and the shower/tub in the next room over – everything in this one is tiled though – no carpet. 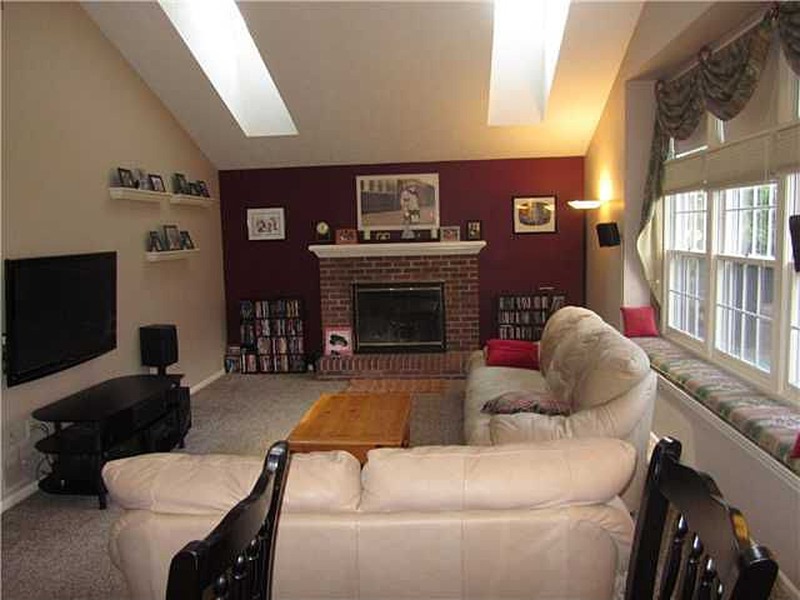 The following 2 photos are 2 of the 3 rooms. 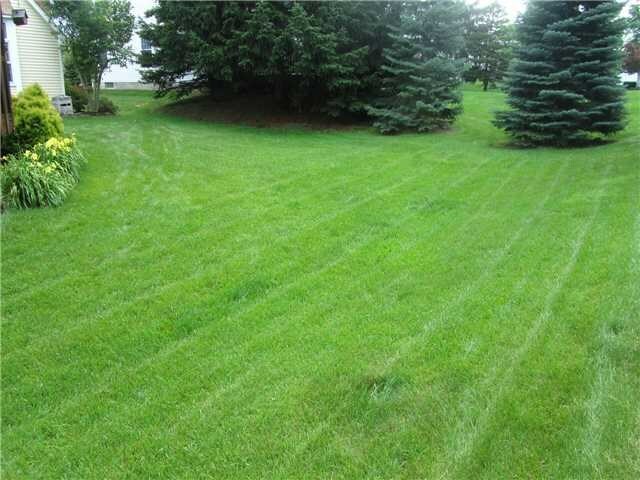 The yard – there is a slight incline in the front yard – the driveway slopes a bit. Going around the side of the house they did a nice job building up a stone wall with a garden where it begins to slope down. The backyard if fairly flat for the majority of it. 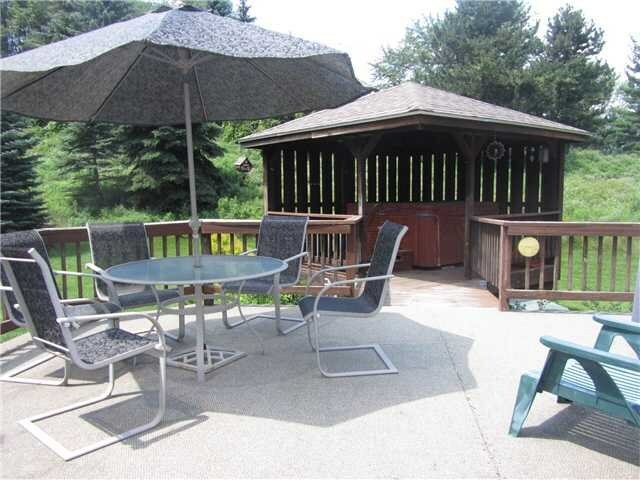 Currently there is a deck that also has a gazebo that has a hot tub under it. I don’t know anything about keeping a hot tub – so that will be a learning curve. 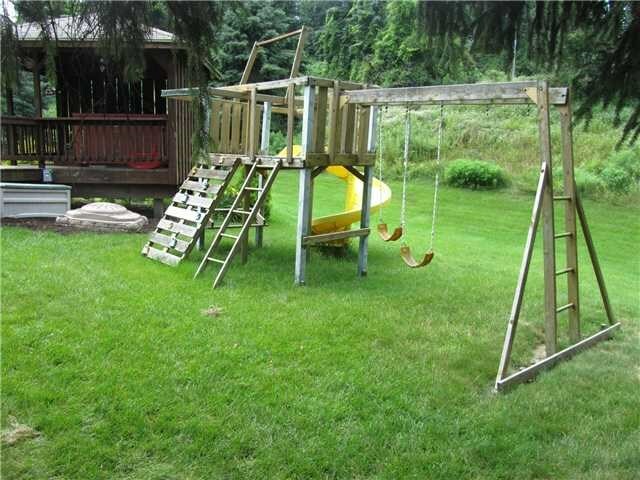 It also currently has a wooden playground – not sure if it’s in the best shape – but something not to worry about for now. 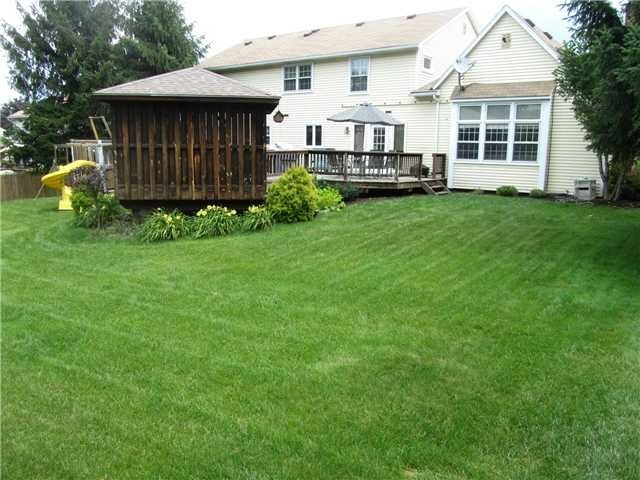 The backyard then drastically slopes upward. There happens to be a fairly busy road that backs up to the house but this slope blocks the view. Plus there are sidewalks! Coming from a main road without sidewalks – that will be appreciated. If you are inside the house in the family room or kitchen – every once in awhile I could see the top of a bike helmet go by. So it’s not as though people can just look in (like our house now). The basement is large, dry, but unfinished. There are some shelfs built out for storage, as well as all the main utilities – including the laundry/utility sink downstairs (great for future paintbrush washing). Going into this house we were told there was already one offer on this house but they couldn’t come to terms. The big issue when looking at this house was that you can tell from looking at it that it needs a new roof. Nobody loves moving into a house and immediately dropping money on the roof, however we did it for or current house so as long as it’s budgeted in we knew we could handle it. So we decided to put an offer in. And they accepted with the agreement that they wanted to keep some of the kid’s curtains. The tricky part of this offer is that we had to go contingent on the sale of our house. There is a term written in that they have to give us 24 hours to go non-contingent if a non-contingent offer happened to come in. Slightly nerve wreaking since in theory we could go non-contingent but in reality we would be draining all of our savings account. So part of the contract is to get a home inspection within 7 days. Which we did. We knew from the property disclosure there were some issues with the fireplace – but we didn’t know how extensive – so we hired a chimney inspector to come out as well. Basically the estimate to get the fireplace in working order again was $6500 (!!). We put money aside knowing the roof needed work – but we weren’t planning on that expense. It turns out in addition to the 2-3 cracked flue tiles and broken cap at least 15 rows of brick need to be taken down and built back up. So of course we went back to the sellers and asked for money towards the chimney getting fixed. After a few more rounds of negotiations and another estimate we agreed on an amount. So it looks like we are buying a new house! Now we just need to sell our current house!